Northeast India is made up of seven separate but adjoining states, as well as standalone Sikkim, and is the most tribal region of India. Although the mountainous scenery is arresting, the northeast region remains the least visited part of India. This has been due to its remoteness, and also the permit requirements placed on tourists. Ethnic violence, as well as the northeast's sensitive location bordering Bhutan, China, and Myanmar, remain issues. Assam, Meghalaya, Nagaland, and Tripura are regarded as relatively peaceful though. Tourist numbers to the region have been dramatically increasing in recent years. Find out about what to see there in this guide to northeast India states. Want to Take a Tour of the Northeast Region? Kipepeo is involved in sustainable and responsible tourism, and capacity building in local communities. The company offers a wide range of custom and flexible departure trips and homestay accommodations. Root Bridge is a responsible tourism company that endeavors to tell the untold stories of the Northeast. North East Explorers, The Holiday Scout and The Greener Pastures are also recommended. If you're planning a trip to the northeast, also have a read of this important information to know before you go. Until recently, travel to Arunachal Pradesh was highly restricted to foreigners due to its proximity to China. The Indian government has relaxed permit requirements somewhat, and added new tourist circuits, bringing the total number to 12. Limitations on independent travel, the places that can be visited, and the high cost of travel does discourage foreign tourism to the state though. However, adventurous young Indian backpackers are starting to flock there. Tawang Monastery is the state's most well-known attraction. Perched at 10,000 feet above sea level, it overlooks the Tawang Valley near the border of Bhutan. The monastery is the largest Buddhist monastery in India. It also has a fascinating collection of thangkas (Tibetan paintings). If you can, visit it during the Torgya Festival in January or Tawang Festival in October. Other attractions include pristine national parks and remarkable tribes. In the Ziro district, the annual Dree festival (early July) and Myoko festival (late March) of the Apatani tribe, and Ziro Music Festival (late September) are popular too. The Mopin Festival of the Galo tribe is celebrated in Arunachal Pradesh in early April. Assam is the largest and most accessible of the northeast India states. It's best known for its tea, and around 60% of India's tea is grown there. The capital and gateway of Assam is the sprawling and rather unattractive Guwahati. Most people spend a few days there though, despite its ugliness, as it's the best place to organize tours around Assam and the other north east India states. There are also a number of temples of interest in Guwahati. However, the most famous attraction in Assam is Kaziranga National Park, home to the rare Great Indian One-Horned Rhinocerous. Smaller and lesser-known Pobitora Wildlife Sanctuary is an excellent place to see these animals as well. Also, don't miss visiting beautiful Majuli, the world’s largest inhabited river island. 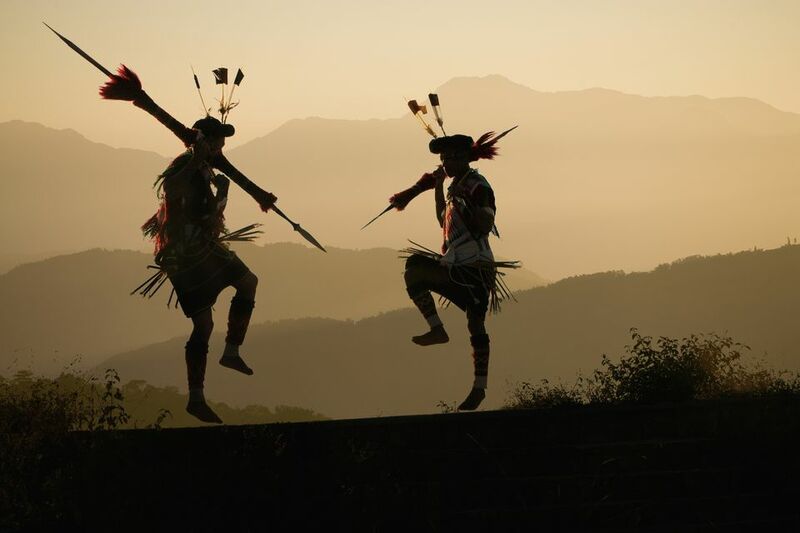 There are 16 major tribes in untamed Nagaland, which shares a border with Myanmar. Relatively new to tourism, the people are curious, warm, informal -- and open to attracting visitors. You'll never feel alone when visiting villages in Nagaland. And, there are tourist lodges with cultural programs in almost every location in the state to accommodate you. However, what's really placed Nagaland on the tourist map is the fascinating tribal Hornbill Festival (first week of December), Moatsu Festival (first week of May), and Aoling Festival of the Konyak tribe (first week of April). Manipur, located on the far northeast border below Nagaland, has been described as the Jewel of the East due to its picturesque hills and valleys. The capital, Imphal, is surrounded by wooded hills and lakes. Loktak Lake, with its multitude of floating swampy islands, is remarkable for being the only floating lake in the world. Stay at Sendra Park and Resort for the best experience of it. Manipur has recently begun taking steps to develop its tourist potential, which is essential as the state struggles to overcome poverty in rural areas and rebellions between ethnic groups. A Lemon Festival is held every January in Kachai and the Kang Chingba Festival is also a big event. Meghalaya used to be part of Assam. Known as the Abode of the Clouds, it's one of the wettest places on earth. So, do choose the time when you visit wisely! Capital Shillong was a popular hill station during colonial times, with leftover features being a championship golf course and polo ground, Victorian bungalows, and churches. Concrete buildings have sprouted since then, but the charm hasn't been completely lost. The abundant natural attractions in Meghalaya include peaks, caves, waterfalls, lakes, and ancient living root bridges. In fact, Meghalaya has the largest number of known caves in India. Mizoram juts out at the bottom of the northeast region, finger-like in its form. Its landscape is stunning and varied, with dense bamboo jungles, plunging gorges, rivers, and lush paddy fields. Mizoram will hold a great deal of appeal for nature lovers. The state's festivals provide a good dose of culture as well, with the Chapchar Kut being one of the most popular. Tiny Tripura, almost surrounded by Bangladesh, is the second smallest state in India. Heavily forested, it's renowned for its vast array of bamboo products. Handloom weaving is also a significant industry there. The mixed European-Mughal style Ujjayanta Palace provides interest at Tripura's capital, Agartala. However, as it's occupied by the State Legislative Assembly, only the grounds can be explored. Tripura's star attraction, however, is the lake place of Neermahal. It was constructed as a summer resort in 1930 by late Maharaja Birbikram Kishore Manikya Bahadur. There's a boating facility on the lake. Tripura also has a number of Buddhist temples, giving it appeal as a Buddhist pilgrimage place. Unakoti, a Shiva pilgrimage site, has the largest rock-cut images and stone idols of Lord Shiva in India. The ​Himalayan state of Sikkim was recognized as part of northeast India in the 1990s. Bordered by China, Nepal and Bhutan, Sikkim has long been regarded as one of the last Himalayan Shangri-las. There's something very soothing to the soul about the mountainous beauty and ancient Tibetan Buddhist culture in Sikkim. Read more about Sikkim's top places to visit.